Facebook is testing a new version of its search engine. A fraction of the social network's users are now able to trial an improved search function, which besides finding users, pages and groups, can also look through content posted from people, organizations and public figures. A limited number of test users are now seeing new layouts for search results in Facebook. It's basically Facebook search on steroids: next to people's profiles, pages groups, and apps (which the rest of the social network's users see now) the new search results will deliver items from users' news feeds (updates, photos, links, videos, and notes). It is a big push forward from Facebook, after the recent redesign that includes Twitter-like near-real-time updates from your friends the news feed. Besides searching through your friends' profiles and the pages you watch as a fan, the improved Facebook search engine can also look through content posted by people who chose to make their profile available publicly. Unfortunately, Facebook didn't include me in its exclusive little test search club, but Facebook developer Kari Lee demonstrated on her blog how this new search works. 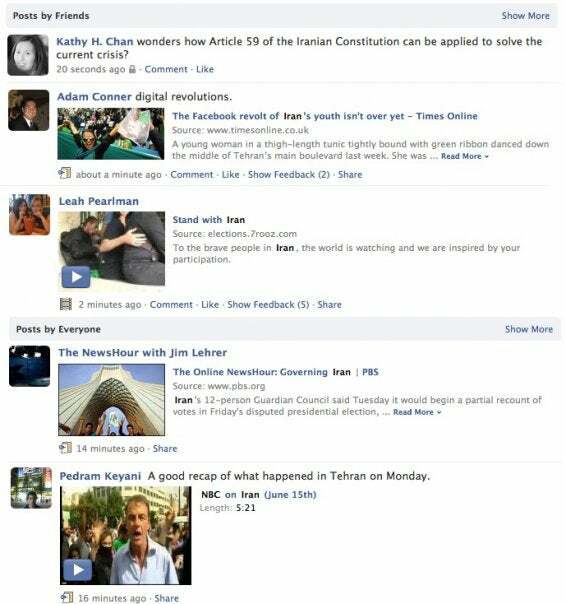 Using a topical trend, she entered the term "Iran" in the search field in Facebook, which then displayed "up-to-the-minute results" from pages and friends. Adjacent is a screenshot of the results (click to enlarge), which also displays content posted by people whose profiles are public -- a nice little way of discovering new content and resources. Facebook is just testing the new improved search on a limited number of people now, but Kari Lee said that the social network might expand the test to more people in the coming weeks, as the trial gathers more feedback from beta users. So far, this looks like a neat addition to Facebook, especially as more content gets published on the network lately, including from big media such as CNN (PC World is on Facebook also -- find it here).